CONDITIONS OF SALE: Painting must be exhibited free of charge in the National Gallery of Australia at least 100 days every year, and it has to be offered free of charge to the Aboriginal Tent Embassy in Canberra for another 100 days every year. TECHNIQUE: Oil on canvass, unframed. STORY: The title of this painting is a play on words "White Supremacy" and abstract "Suprematism". The latter refers to the artistic style developed by Kazimir Malevich (1879-1935), a Russian abstract painter and art theoretician, who frequently arranged basic monochromatic geometric forms in such a way that they express the supremacy of pure artistic feeling rather than representing visual depiction of objects. In particular, his famous "White on White" oil on canvas (1918) was paraphrased here, but giving a completely different meaning to the white square, which here symbolizes white Australians and their long-held policy of White Supremacy. The rest of the canvas is done in a style reminiscent of the Aboriginal dot-panting, and using the colours of the Aboriginal flag. Note that the structure is falling apart in the approximate vicinity of the white square, while it is held together (and colours are more vibrant) further away. This painting is a testament to the enormous shame that most non-indigenous Australians feel for what they have done (and in many ways are still doing) to the Aboriginal people and culture, and to their land as well. The price is also the number of indigenous Australians left. 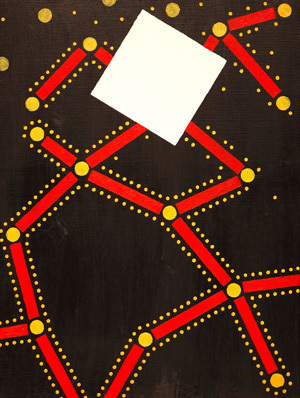 White Suprematism is an ideal AbFab painting, because it uses only two colours and two simple geometric shapes.